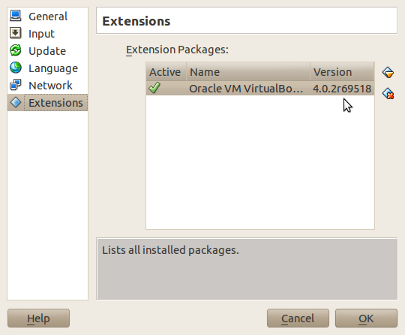 How do I install the VirtualBox version from Oracle to install an Extension Pack? I downloaded VirtualBox OSE from the Ubuntu Software Center but it seems that that version is limited. I prefer to have the complete version and don't really care if it's closed source or not. Can I install it via a terminal or do I have to download something from a website? I don't know how to install software I download from the web. So far I've only used the Software Center. Prior to version 4.0, there were two versions of VirtualBox— one was open source, and the one that most Linux distributions shipped with was not. At this point, there should no longer be two separate editions and the "OSE" version is deprecated for versions of Ubuntu beyond 12.04. However, the most recent version of VirtualBox is always available for the currently supported versions of Ubuntu, which is not always the case for the Ubuntu version. This will provide the latest bug fixes and features without having to wait for the packages to make their way downstream to Ubuntu. Additionally, should you ever need support from Oracle themselves, they're more likely to give you the time of day if you're reporting from a version they released. sudo add-apt-repository "deb http://download.virtualbox.org/virtualbox/debian $(lsb_release -cs) contrib"
sudo add-apt-repository "deb [arch=amd64] http://download.virtualbox.org/virtualbox/debian $(lsb_release -cs) contrib"
You may also read notes on how a repository or a PPA works. Replace -5.0 by the current Virtual Box release. To gain extended functionality such as USB 2.0 or USB 3.0 support or support for Remote Desktop Protocol (RDP) you can make your Virtual Box installation closed source (see the Personal Use and Evaluation License) by downloading the Oracle Virtual Box Extension Pack. You have to visit the Oracle Virtual Box Download page to obtain the present download link with Virtual Box <version> and the current <filename> of the extension pack available for download. Note: Extension packs always need to be for the same Virtual Box version. Replace <filename> with the path to your downloaded extension pack and use the option --replace in case you have an older version of the extension pack already installed. Note: On upgrading Virtual Box to a newer version we also have to manually upgrade the extension pack. This will not be done automatically from the repository. 3D support (to run Unity), better desktop integration, changing the virtual screen geometry, and more can be achieved by installing the Guest Additions. to a separate extension pack. From the 2nd link: You can install the Extension Pack from the command line using VBoxManage. Not the answer you're looking for? Browse other questions tagged installation virtualbox virtualization or ask your own question. How to install VM box in ubuntu16.04? How do I install Guest Additions in a VirtualBox VM? How can I install Windows software or games? How to install VirtualBox from command line? How to use Ubuntu-provided virtualbox package after uninstalling virtualbox-4.1? How harmful is VirtualBox extension pack?